In all footwork individual steps should be clean and crisp, with no dragging, shuffling or lifting to reorientate at the end. Each foot should only step once. In all of the footwork the aim is to try and keep the torso and shoulders close to square to the line of engagement, as this gives equal use of both arms. The pass is the bread and butter step of the system, and is used extensively. There are 2 variations depending on whether one starts from passo stretto or passo largo. The pass begins with the rear foot stepping forward and sideways at about 45° to land about a shoulder width apart from the stationary leading foot. From passo largo that would be just in front of the line of the toes of the stationary foot, and in passo stretto that would look like you had expanded to passo largo. When we are told to pass with a single foot, it refers to just this single step that has just been described. The pass completes with the stationary leading foot making a corrective step by compassing behind the new leading foot, returning you to a passo largo stance. The new leading foot should pivot on the ball of the foot, so that the front toes are pointing in the correct direction. We have now swapped which foot was leading, as well changing the angle of the diameter of engagement. 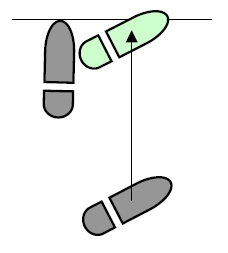 These two steps together describe the footwork required when we are instructed to pass in a direction. When making the pass with an attack, it is possible to lean forward to make the attacks on the first step, and leaning back to withdraw the torso during the corrective step. This should not be learnt initially as it will throw out the balance of the student trying to learn the new footwork. In the initial learning stage concentrate on keeping the torso and head straight and upright, in line with the angle of the straight back leg. 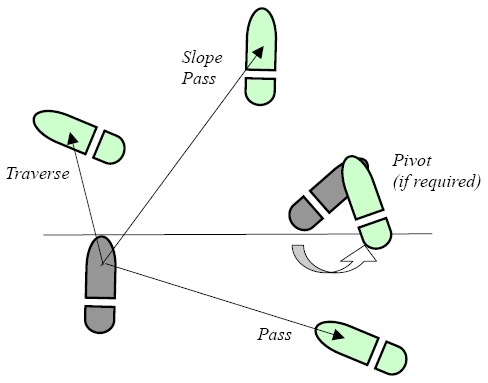 The slope pass uses the same initial step as the pass. When the stationary foot makes the second step, it will also move forward and in the same direction as first step, returning you to the same leading foot orientation in passo largo. There are also several instances where you finish in passo stretto. 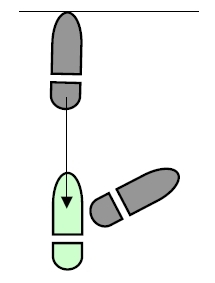 As the second step is made the foot should orient towards the enemy as it lands, and the rear foot should again correctively pivot on the ball of the foot to correctly orient the fencer. The step is typically used for chasing down an enemy who retreats with large steps from offensive actions. The pass and traverse uses the same initial step as the pass. The second step, which is made by the previously stationary foot, is to step horizontally sideways away from the first foot, landing just in front of the line from the toes of the first moved foot. The first moved foot now steps for a second time, making the corrective compass step behind the leading foot, returning you to the same initial opening stance, but to the outside of the previous starting position. This step is typically used to make a radical redirection to hit an open target, with an initial attack or parry to control the opponent’s sword allowing the traversing step. 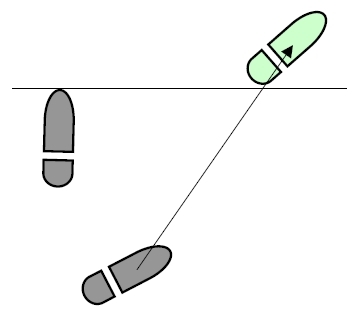 The horizontal sideways step and following correction is also called a traverse step. The speed for the traverse step comes from the pivot of the stationary foot, which quickly orients the hips and torso in the direction the traversing foot needs to move. The pivot action is done on the ball of the foot, turning the heel outwards, and the toes towards the traverse direction, allowing for the traversing foot to step swiftly. The slip is performed from a passo largo stance. The front foot moves back to the rear foot to make a passo stretto stance. The action pulls the front leg out of the path of descending cuts. The slip can then be followed by any of the passing steps, or the slipped foot can step back to its original position. This is a contraction action from passo largo to passo stretto on the part of the fencer. The gather, or gathering step is another transition from passo largo to passo stretto. The gather is made when the rear foot moves up next to the leading foot to make a passo stretto stance. This can then be followed by any of the passing footwork, a step forward with the leading foot, or even a step back with the gathered foot. This is the preferred method for closing distance with the enemy, as the gather does not cause a big forward movement of the torso, which would bring the body into danger.